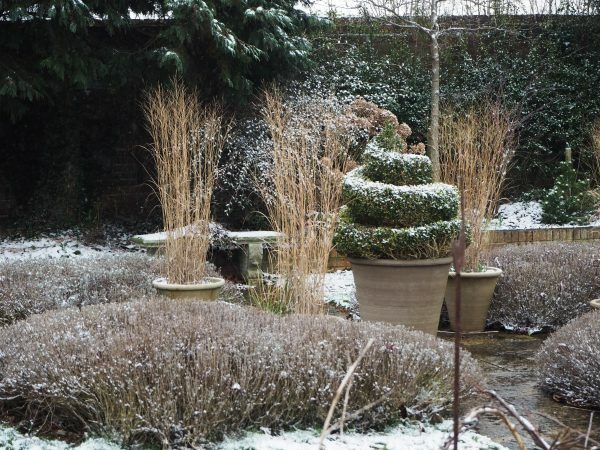 Here in the South East (of England), we’re assessing the winter damage to our gardens. The real problems weren’t caused by the snow, freezing winds or low temperatures of late February. Snow and ice in early March here in the Middlesized Garden. It followed a period of warm weather, when this lavender sent up tiny new shoots. 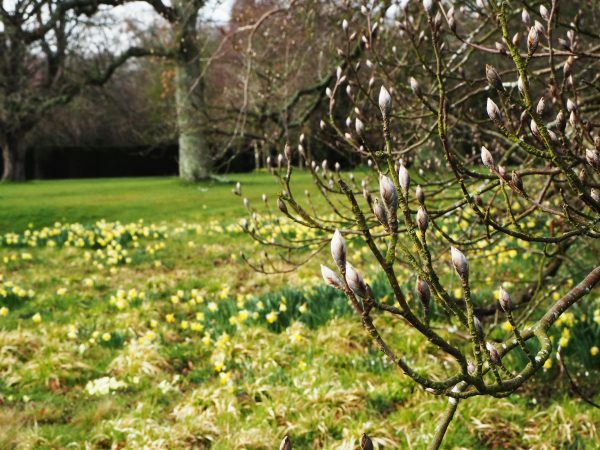 Lucy Adams, Head Gardener of Doddington Place Gardens, told me that the real issue was the week of warm weather at the beginning of March, just before low temperatures, snow, ice and wind returned. Sap started rising and shrubs started budding. When the bad weather hit, the plants were much more vulnerable than they would have been a month earlier. ‘The temperature here at Doddington suddenly went down to minus 14 (centigrade),’ she says. It had been around nine or ten degrees the week before. 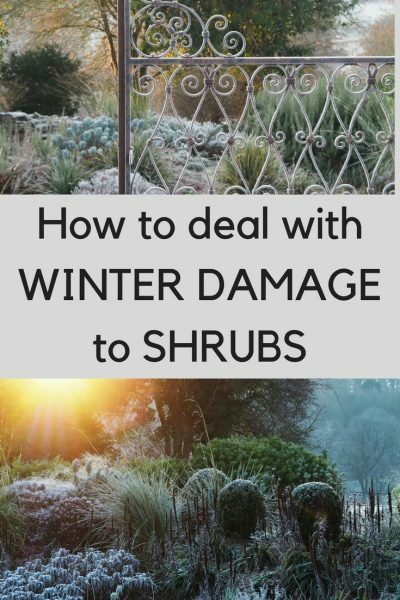 What does winter damage look like? My lavender had tiny buds on it. Many of these look burnt. And almost all the leaves have fallen off my privet hedge. Much of the new growth looks blackened or burnt. But I can see the odd pale blue bud! 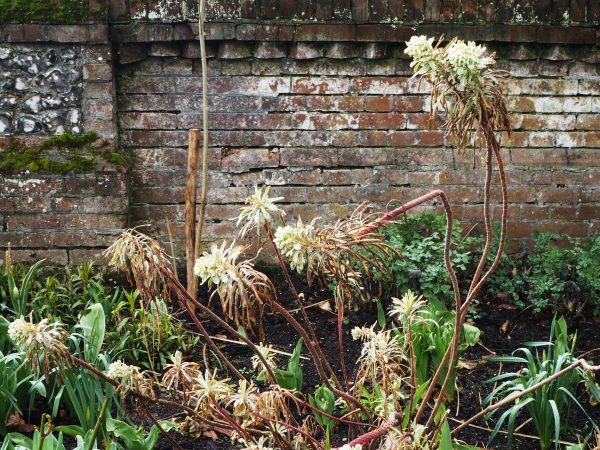 So I went to Doddington Place Gardens to ask Lucy what I should do about my winter damage. ‘I’ve never before seen such a wide range of shrubs and trees affected,’ she said. ‘We’ve got leaf drop and scorched leaves on pittosporum, ceanothus, euphorbia, crinodendron, griselinia and eucalyptus. 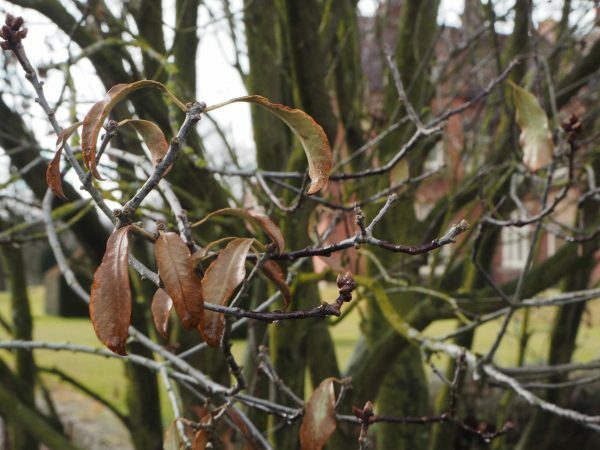 What do about winter damage to shrubs? 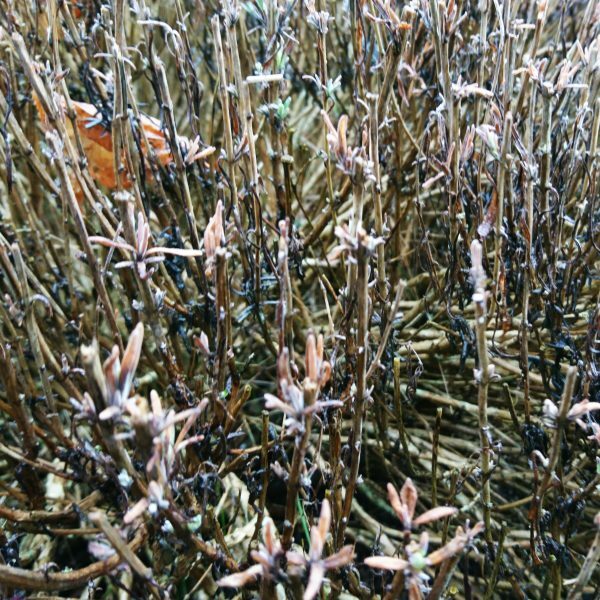 Lucy’s advice is to ‘wait and see.’ Patience is the key, because some winter-damaged shrubs will grow back but there’s not a great deal you can do to encourage them. She advises you to clear weeds around the roots, so that shrubs aren’t having to compete for nutrition. ‘A layer of mulch will probably help, too.’ She doesn’t think high dosage fertilisers will necessarily help, but a few inches of garden compost, well-rotted manure or mushroom compost is a good idea. Should you cut off the damaged shoots? Lucy says that if you prune back the damaged part of the plant, you may shock it too much. ‘Wait until it’s the normal time to prune that plant,’ she advises. There is a ceanothus at Doddington which has one side burnt by freezing wind, while the other side is fine. Lucy is going to see whether the damaged part will re-grow. She may cut that part back – right down to the ground – but not until she’s waited to see whether it bounces back and pushes up new shoots. Lucy is particularly concerned about a very large pittosporum which dominates a border at Doddington. She doesn’t want to hurry any decision to take it out, although it does look very scorched. It would leave a very large gap in the border. This is a large mature pittosporum that has undoubtedly survived worse winters. Has it survived this one? But she is encouraged by ‘the scratch test’. Scratch away a little bit of bark with your finger or a knife. If there’s green underneath, then the plant is still alive. There is green under the bark of the pittosporum. And if the shrub has died? Not a happy euphorbia! Nice garden wall in the background, though. ‘Just watch and wait.’ That’s my favourite kind of gardening advice. It’s ‘no-effort’ and doesn’t cost anything. 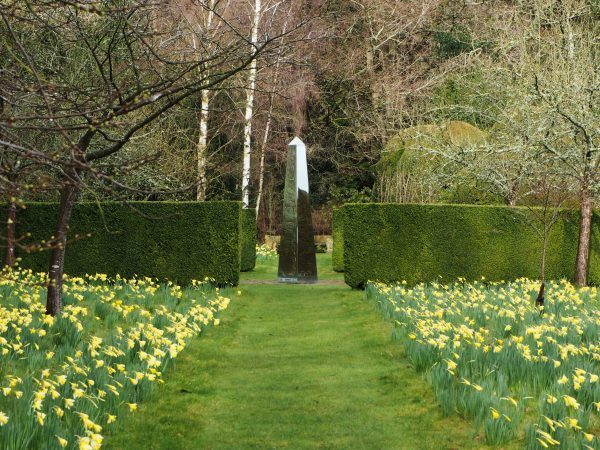 The Millenium obelisk sculpture at Doddington Place with daffodils, out in March and April. Doddington Place Gardens, near Faversham, Kent, is open to the public on Wednesdays and Saturdays 11am-5pm between 1st of April and 30th of September. And you can read its very interesting garden blog. Finally, here are a few photos to show that most of Doddington Place Gardens has bounced back beautifully. This magnolia seems to be unaffected by any kind of winter damage. 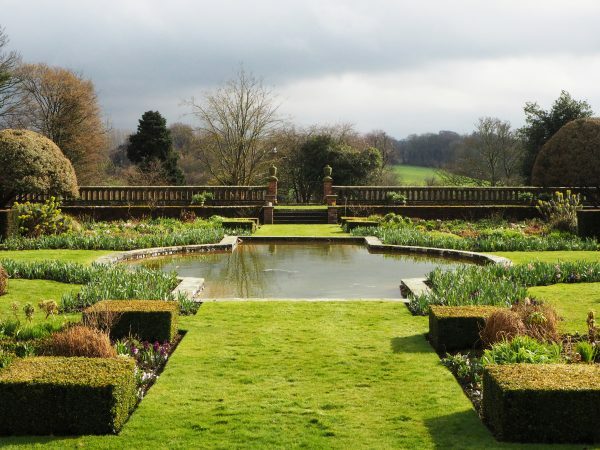 Brooding skies over the romantic Sunk Garden at Doddington Place in late March. 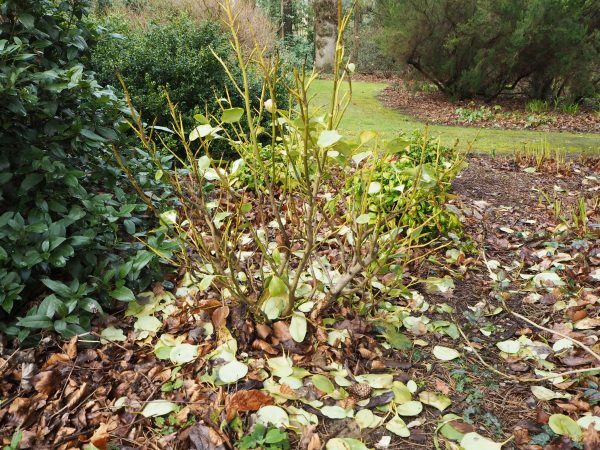 6 comments on "How to deal with winter damage to shrubs…." The damage sometimes takes time to appear as well. I initially thought I’d escaped lightly. But it looks like I’ve lost Verbena bonariensis, of which I had three large drifts and used to be perennial here, plus cistus. It feels like a long wait to see what else will fail to produce buds this year. I hadn’t thought to look at the ceanothus. Crinodendron may still be OK. Fingers crossed! I love drifts of verbena bonariensis, but I’ve often found they don’t come through the winter – maybe a very short-lived perennial? Every morning I peer anxiously at a rose that looks like a scorched stump, and walking the dog round the streets here, I can see so many shrubs burnt by frost or freezing winds on one side. So it will be interesting to see what survives and how – hope your crinodendron survives! It’s not surprising really. We grow lots of plants from places closer to the equator than here (most of the world!) and often get away with it because of our mild maritime climate. I think you just have to expect to lose some plants every decade or so if you don’t pick plants that evolved to cope with the odd arctic blast. Unfortunately it seems likely that winters will get harsher ovet coming decades on average. I’m not a climate scientist, but my understanding is that as the arctic warms the jet stream is likely to weaken, with the counterintuitive result that cold air will be more likely to hit the UK in the winter. And the trend to a greater spread in seasonal temperatures would be even greater if the gulf stream shutdown, but most people seem to think that’s a century or two away so we probably don’t have to worry about it. I agree, I think we ‘get away with it’ as gardeners here in Britain especially in the South and West, so we’re normally very lucky. This winter we weren’t, and maybe other winters to come…but that’s what makes gardening so interesting. Thank you for this. I started a new Garden from nothing late summer, costly and a lot of hard work. I think I have lost my Phormium and both Cordylines as well as 2 sad looking Pittosporum. My Acacia dealbata looks dead and I am trying to believe that my Musa is only sleeping. I now have a glimmer if hope . Good luck – I do hope they all survive. My brother-in-law has cordylines in very cold weather, and they seem to survive quite well.